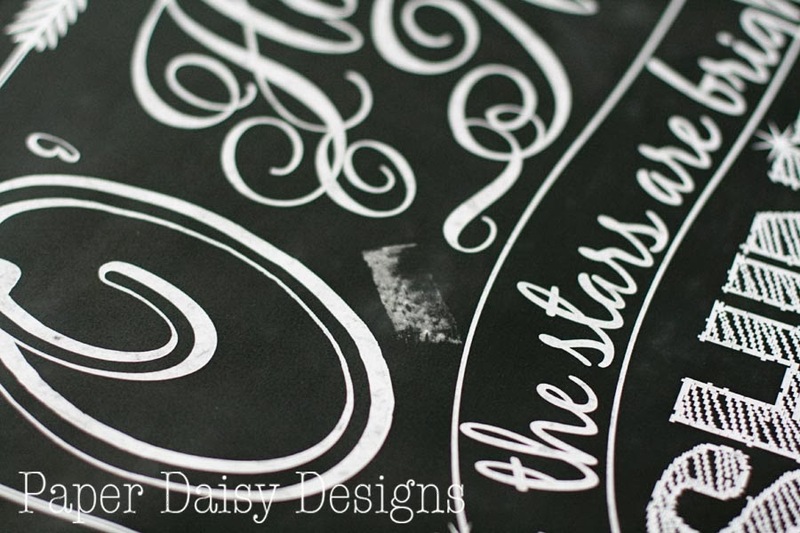 I love to create chalkboard art by hand. I love that it’s both art and a message. 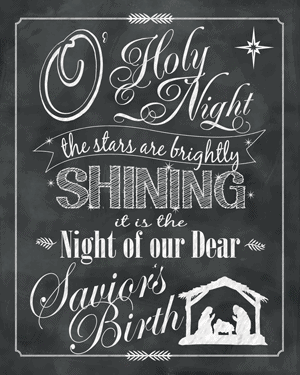 If you do to, then this Chalkboard Printable is for you! While my hand lettering is not always perfect, it is much more relaxing and gratifying than creating it on the computer, albeit very time consuming. There’s nothing fast about hand-lettering. I do, however, always layout my design on the computer as a guide first. I realize not everyone feels confident enough to hand letter anything, much less a Christmas chalkboard. 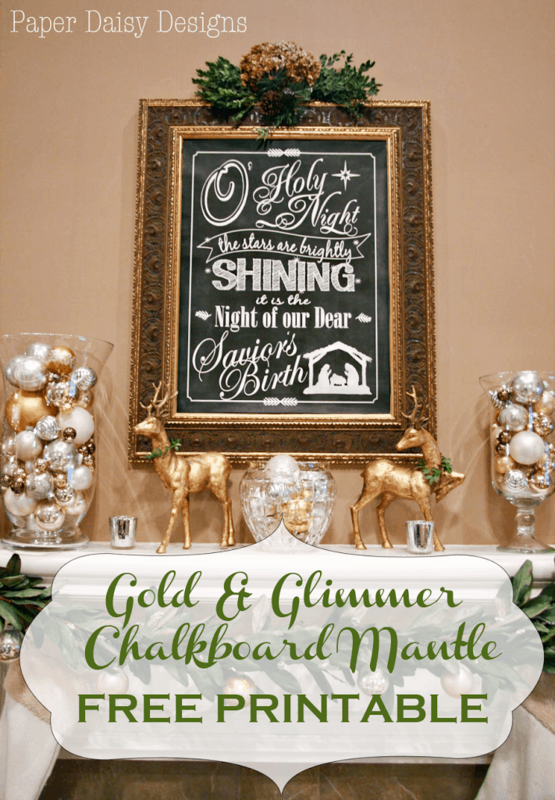 So this year, I decide to do both you and me a favor and refresh last year’s mantle chalkboard art as a printable that can be used year after year. 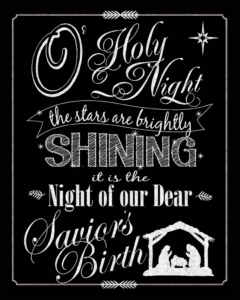 Not only that, it can be a large scale printable that will cost you less than $2. Here’s last year’s hand drawn version. Can I tell you how painful it was to wash it off when Christmas was over? Do you know about Engineer prints from Staples? 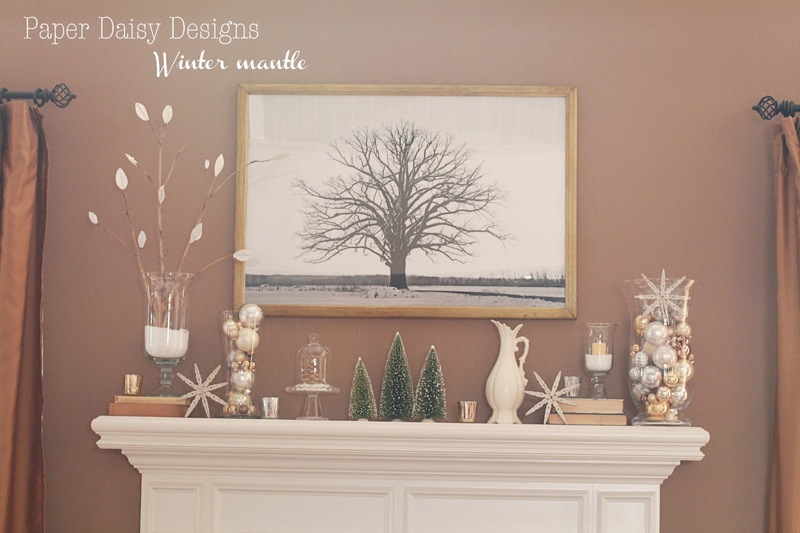 I used one for my winter mantle last year. The coolest thing about an engineer print is the price. 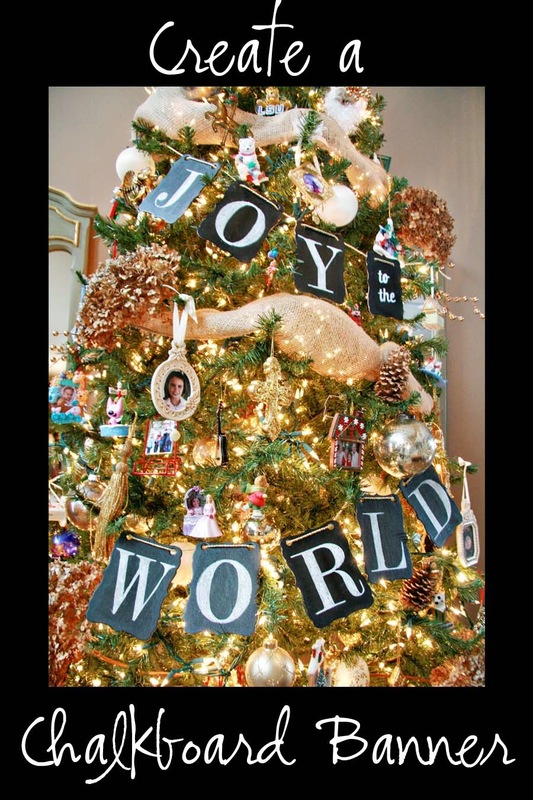 This larger sized tree print was still only around $3. These prints are only for black and white photographs or art and the paper is very thin, but with a little tender care and proper backing they can be quite versatile. The one thing I learned this year is that type of printer doesn’t know how to handle large areas of dark grey background like a chalkboard. The first print I picked up was an ugly, grey, dotty mess. In order to get an authentic “chalkboard” look on the solid black background I was forced to use, I simply rubbed the side of a piece of chalk randomly around the poster. 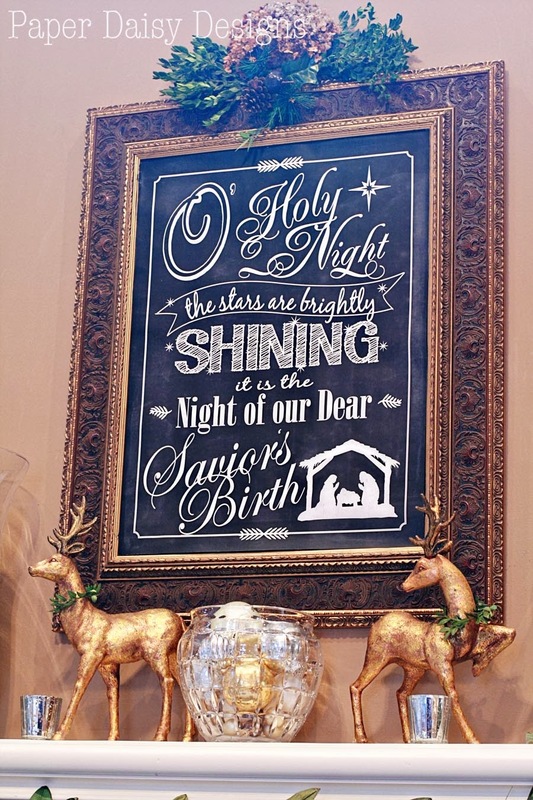 Just add marks of chalk around the words, along the outside border and wipe with an eraser or a paper towel. To mount the poster to my chalkboard, I used some two sided adhesive squares. Just be sure your adhesive is not too permanent, if you want to be able to remove it later. 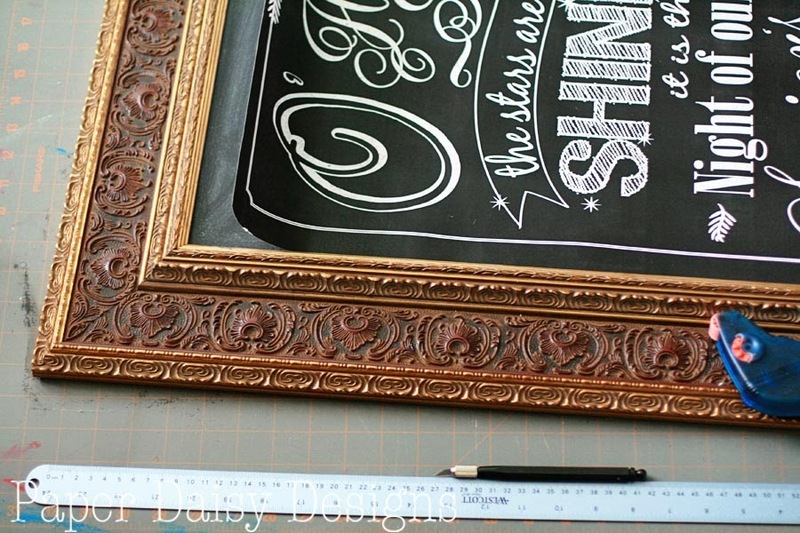 If you need to make a chalkboard to go inside your frame, this one is simply a piece of foam core cut to fit my 18×24 frame and painted with several coats of chalkboard paint. I actually painted over a Mod Podge print that was already mounted on the foam core. Reimagine and reuse is definitely my motto. 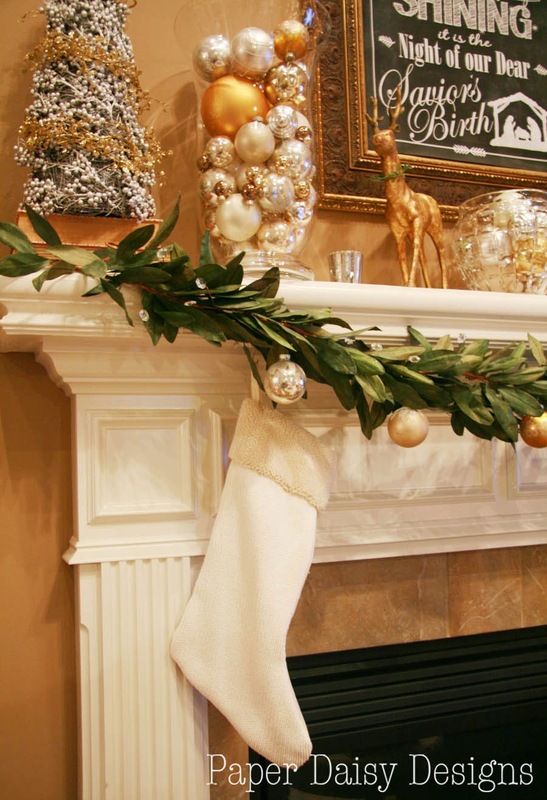 Now let’s get another look at the mantle. In addition to my focal chalkboard art focal point, I used large glass hurricanes filled with various Christmas ornaments in gold, silver and pearl. 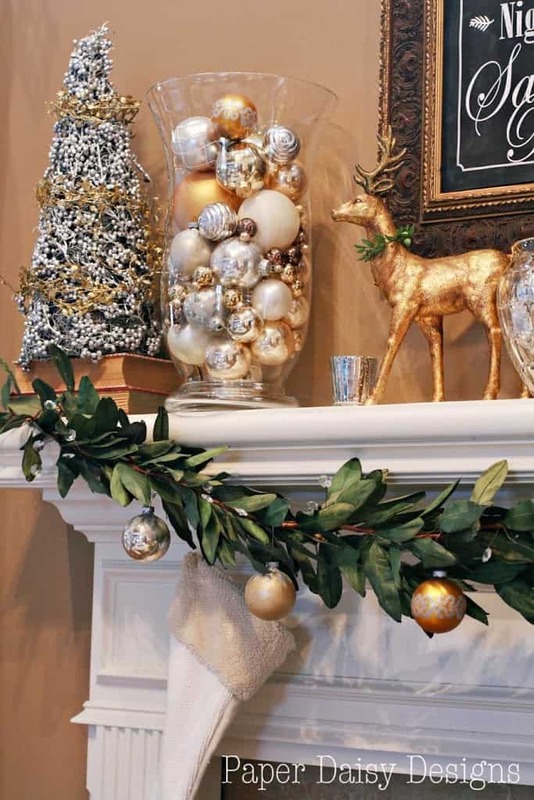 The gold reindeer are adorned with preserved boxwood. 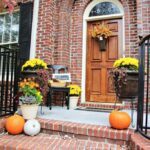 If you’d like to learn how to preserve boxwood and make a square wreath you can check out those posts. Some of the ornaments in the vases are vintage glass balls from my husband’s family. They are too precious to me to chance them accidentally crashing off the tree. The berry mantle trees are also got a makeover this year. A little bit of silver spray paint over the red and now they fit my gold and glimmer theme. New stockings were in order too. I was finally ready to part with the traditional red and green one’s we’ve had since the kids were little. 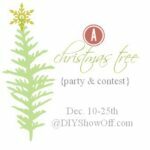 Not to worry, my sentimental heart is still satisified with the memory filled ornaments on my tree if you’d like to read about my approach to Christmas tree decorating. These two stockings were made out of a thrift store sweater and a small cut of wooly fur from the fabric store. I hope to have a simple tutorial for them next week. I just ask you to follow me on Google, Facebook, Pinterest or subscribe via email, also see the bar at the top right. FOR PERSONAL USE ONLY. 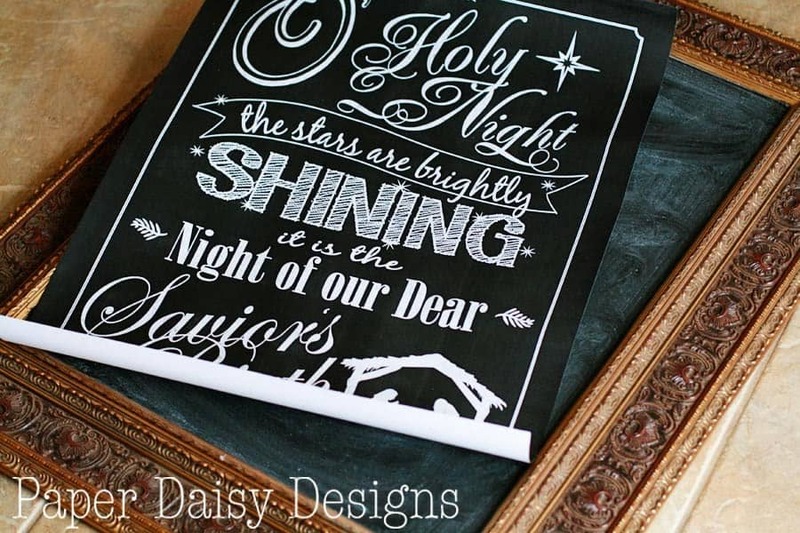 Visit Paper Daisy Designs’s profile on Pinterest. Click here to get the 8×10 version. It has the “chalky” background and looks like this. If you would like to make a Large 16×20 Engineer Print Click Here. Remember I made the engineer print to print with a solid black background because the chalky background doesn’t hold up on that type of printer. It becomes a grey mess. This is what the file will look like. And for all you cut file fans, here is a slightly different version for you as an SVG cut file! 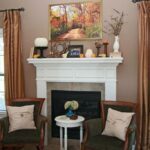 Here’s a look at the mantle in living room. 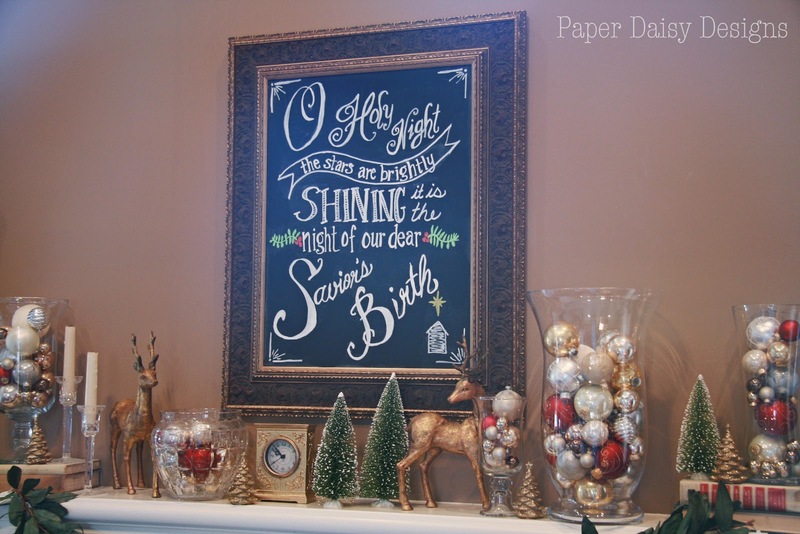 You can see I also made a chalkboard banner for my tree. Check out the complete tutorial here. 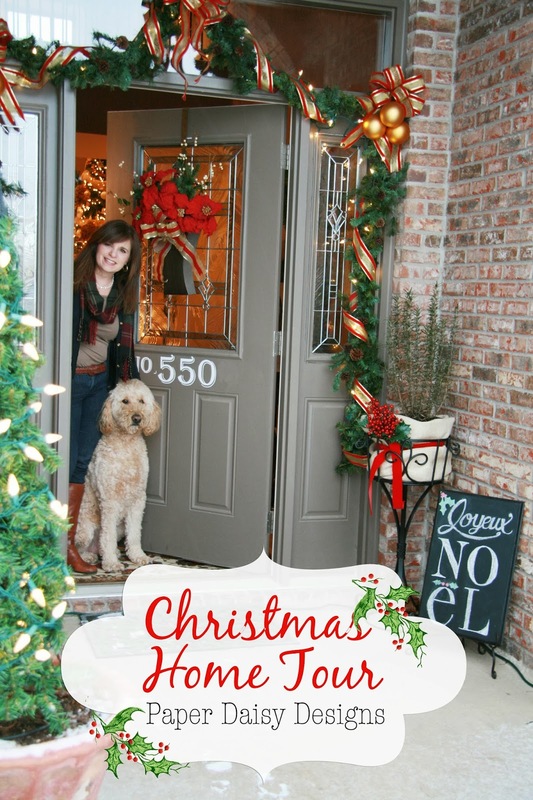 I also invite you into my home for complete Christmas Home tour. Click here. 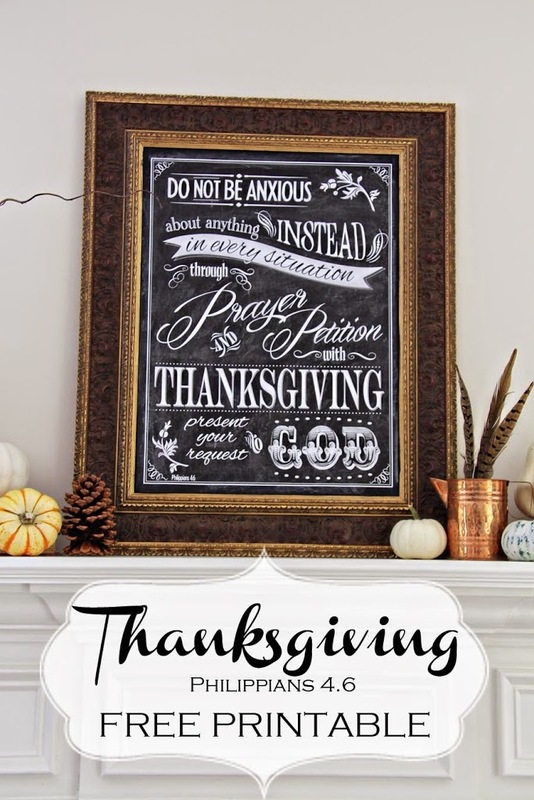 I also have a printable for Thanksgiving! Hi, I love your designs! What program do you use to create them? Thanks Roz! 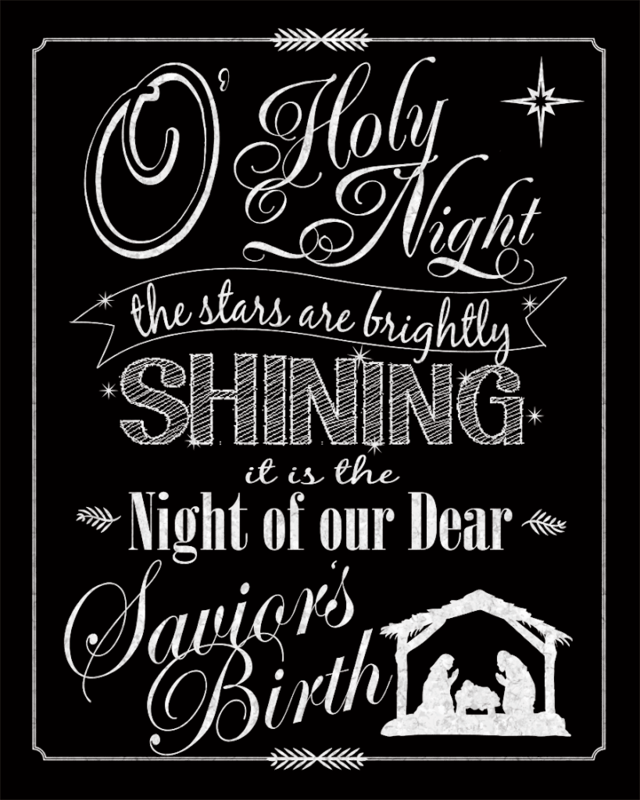 I used Illustrator to draw the manger and set the type and them moved it into Photoshop to create the chalkboard effects. I was wondering if I order the large print 16×20 could I have it printed on a canvas from Shutterfly for example? I was wondering if I bought the 16×20 design would I be able to send it to shutterfly and have a canvas done? How does the file come? What if I wanted to go even bigger. Like 30×39. 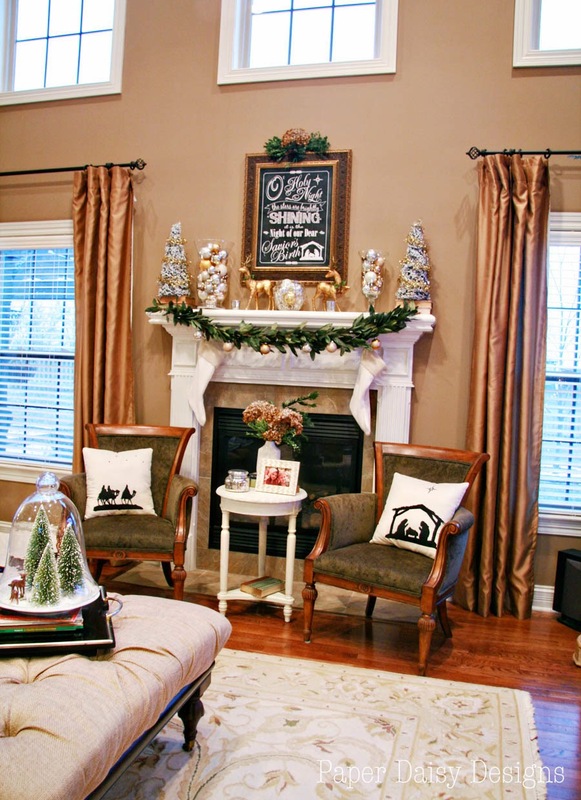 I don&#39;t have a mantle, I have brick with 10 foot ceilings. How do you think it would print? Thank you so much for sharing these for FREE! That&#39;s amazing! 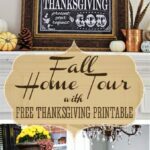 You could easily be making money off of these, so this un-crafty lady is very thankful! 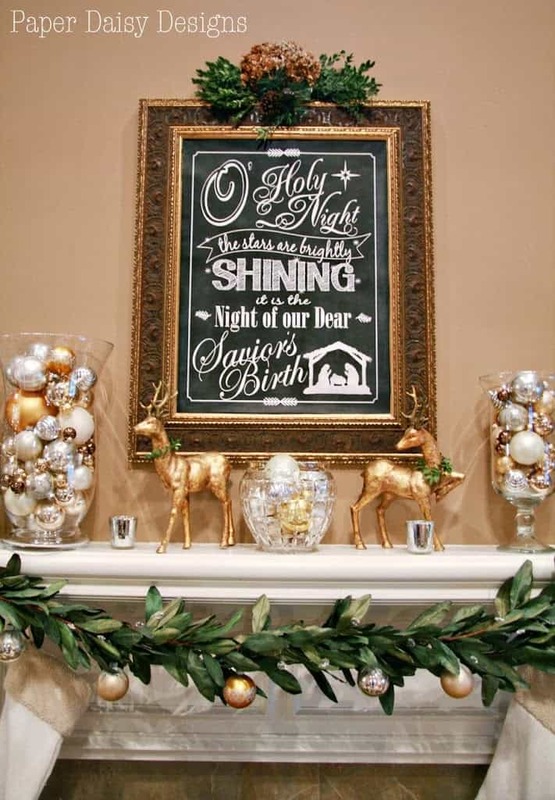 Thank you so much for sharing, I&#39;ve been searching at the stores for something about the true meaning of Christmas for my mantel. I don’t have any printable for anything like that but I do have a tutorial for how to make giant pom pom flowers. They would be a lovely decoration. This is gold! Finally, a Christmas decoration that exhibits the true reason for the season.